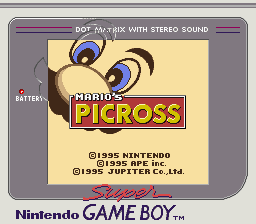 Mario's Picross underwent a few aesthetically fitting changes when the game was released internationally, but didn't sell very well outside of Japan. As a result, the sequel never left Japan. Located at 0x03C010 is development-credit text. Toshiyuki Ueno is the music composer. Compared to the Japanese logo, the international logo is rather bland. 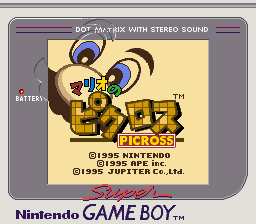 Puzzle 6C in Easy Picross was changed from a cocktail to a Boo. Puzzle 7B in Easy Picross was changed from a wineglass to a silk hat. Kinoko Puzzle 2F was changed from a tsurigane (a type of bell commonly found in Buddhist temples in Japan) to garlic. Kinoko Puzzle 2H was changed from a kama (a kettle commonly used in Japan for making tea) to a hamburger. Kinoko Puzzle 4D was changed from tsukimi dango to a unicorn. Kinoko Puzzle 6H was changed from a beer stein to a crow. Kinoko Puzzle 7F was changed from a folding fan to an angel. Star Puzzle 6H was changed from the face of a Nio to a couple of chili peppers. And finally, three Time Trial puzzles were changed. The den-den daiko, karakasa-obake, and tobacco were replaced by a bee, a giraffe, and a rabbit. This page was last modified on 7 November 2016, at 22:19.